A notable section of the Food Safety Modernization Act (FSMA) calls for the development and implementation of model laboratory standards. To ascertain the level of laboratory standards currently employed by food laboratories, a laboratory testing services company commissioned a survey of laboratory directors, quality assurance managers and technical supervisors. One area of questioning focused on certified reference materials (CRM). In response to whether their laboratory uses CRM, 65% of respondents said yes. Most of the remaining survey respondents (31%), volunteered that they sometimes use these materials, if required. Only 4% replied “No” (see Figure 1). The responses are significant in that they provide a glimpse into current food laboratory quality practices. FSMA tasks the U.S. Department of Health and Human Services with making certain that analytical procedures and quality systems are established and followed. Yet, it is not clear what procedures and systems are currently employed. 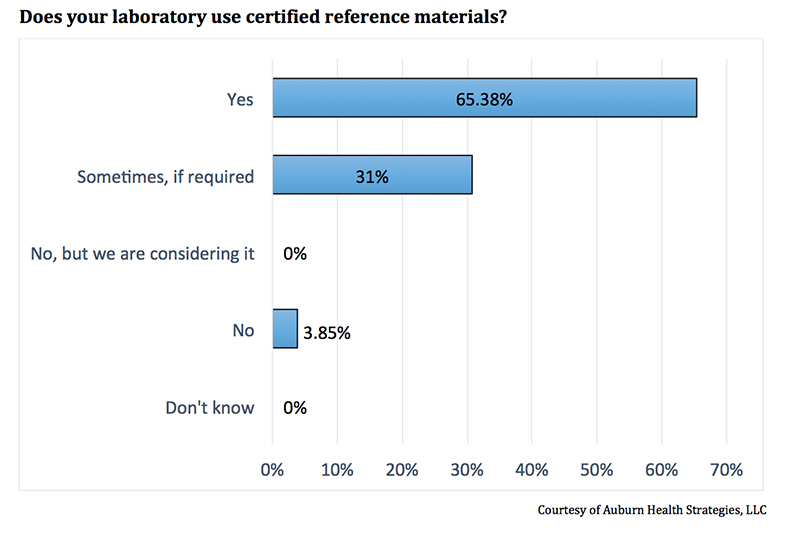 This survey provides a baseline measure from a segment of the food laboratory community, indicating, that a majority of respondents use certified reference materials. A food laboratory aims to provide the correct result every time a test is performed. In order to achieve this consistency and reliability, laboratories should use standard measurements, known as quality controls. Quality controls are essentially the stable norm against which testing processes and instruments may be assessed. By using quality controls, it is possible to find areas in the testing process that may be weak or failing. CRM, used as a form of quality control, are highly characterized, homogenous, authenticated control materials. Food laboratories often have options available for obtaining commercially sourced materials for quality controls, but not all of these options are well characterized or authenticated. CRM are used by laboratories to assess the quality of method validation as well as to trace to an established standard. In the food lab, CRM help provide a level of certainty in the results when instruments and processes are validated and verified. CRM may be obtained from accredited producers, as established under ISO Guide 34. The survey also asked whether on-site and contract laboratories use quality controls. Interestingly, not all laboratories surveyed are using quality control materials as part of their testing processes and procedures. For on-site laboratories, 81% of survey respondents acknowledged using quality control materials. For contract laboratories, the number slips to 67%. For survey respondents not using quality control materials, it is unknown if or how their test results are validated and verified. Quality control is a basic component of laboratory testing as well as a requirement for accreditation. Whether CRM or non-certified reference materials are used, quality controls are important components needed to ensure test results are valid and reliable for food consumers and industry alike. As future FSMA rules on model standards are likely to address this essential provision of laboratory testing, these survey results support the use of CRM. The survey discussed in this article was commissioned by Microbiologics, Inc.